You are currently browsing the tag archive for the ‘chamber music’ tag. Leo Zeitlin’s life and music became a subject of Paula Eisenstein Baker’s research about twenty years ago. Fascinated by Zeitlin’s masterpiece “Eli Zion” for cello and piano, Eisenstein Baker, a cellist with a keen interest in musicology, started to investigate the life and works of this remarkable, but almost unknown, composer. 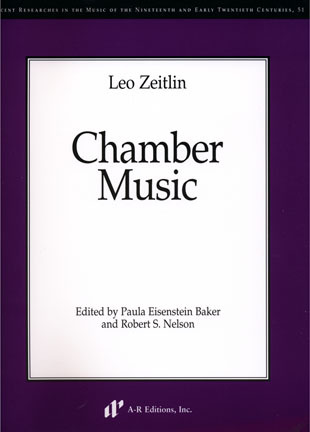 Her research has resulted in this publication of Zeitlin’s chamber music compositions, which is accompanied by a carefully reconstructed biography of the composer, a critical study of his works, and a comprehensive presentation of text settings from the vocal works in Yiddish, Hebrew and Russian.